In a Music Together Big Kids class, 5-7-year-old kids explore how to use their bodies and voices in musical ways—after all, your body is your first instrument! The class can be a great complement to piano lessons, dance classes, and elementary school music. 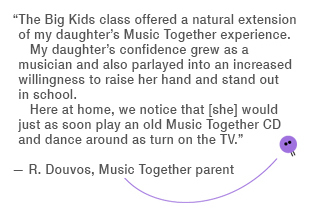 Music Together Big Kids is a 60-minute, drop off music class especially for your five-, six-, or seven-year-old. The program blends the elements of Music Together® that parents and children love with new activities, skills, and challenges created just for kids their age. The curriculum includes solfège, solos and ensembles, folk dances, harmony singing, vocal development, and drumming. In our Big Kids class, your child learns and plays with others, while building leadership and decision-making skills at the same time. Each semester's song collection is based on songs from our family classes — yet Big Kids have their own recording, songbook, and other materials made especially for them. Music Together Big Kids Classes in Charlottesville & Crozet meet on Mondays 4:30 PM - 5:30 PM and begin on September 10, 2018, and meet for 60 minutes once a week for ten weeks.